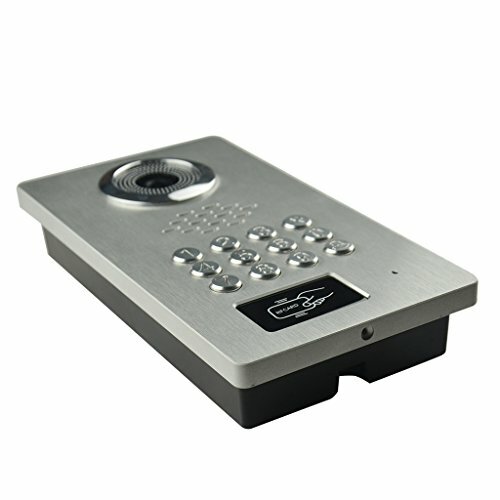 1pcs outdoor HD camera and 1pcs indoor color screen video intercom doorbell system. You can both see and speak with all visitors. 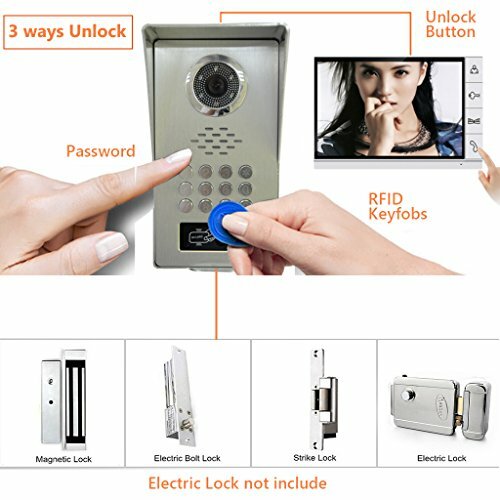 3 ways to unlock( unlock button on the screen, password and RFID keyfob on the Camera) very convenient, speaker, monitoring, dual-way intercom with monitor and camera. 700TVL full aluminum panel camera with press key for protection from vandalism,waterproofing and IR night vision function more practical. 7 Inch LCD touch screen,great sound quality, dimmable display,11 tingtones for choice,white style appearance fashionable,more morden. 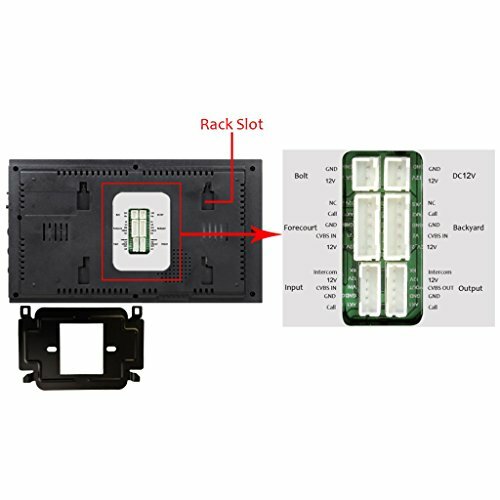 Easy installation,Surface mounting, wired connection stability clear vision for home security,Can be used in apartments,villas,hotels,offices,public buildings. 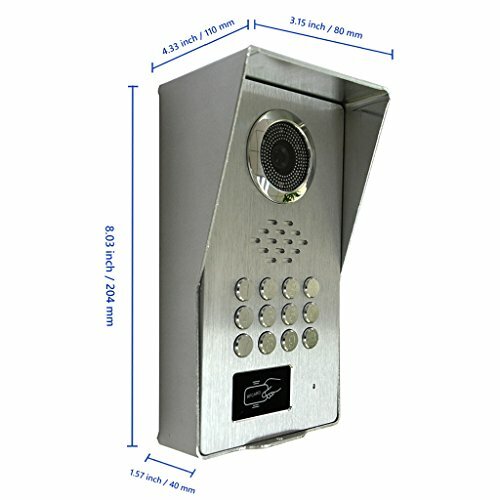 9 inch Video Intercom Door Phone System includes 1- outdoor camera + 1 indoor Moitor.The outdoor doorbell camera provides a 92-degree viewing angle and use a strong, constructed using a full aluminum to protect against potential vandalism. What¡¯s more, waterproofing and IR LED projection provides both durability and clear images no matter the weather or time of day/night.The indoor doorbell Monitor provides great sound quality, dimmable display, selectable doorbell tones for additional personalization,durable ABS/acrylic panel.As you know, it is unsafe and inconvenient for the children, the seniors or the disabled to open the door for strangers. This system provides a solution for you. The person in the house can know who is at the door and open the door remotely without going to door to check. There are 3 ways to open the door lock: pressing the unlock button on the screen; using a Password; using RFID keyfob. It is very convenient for your daily life. 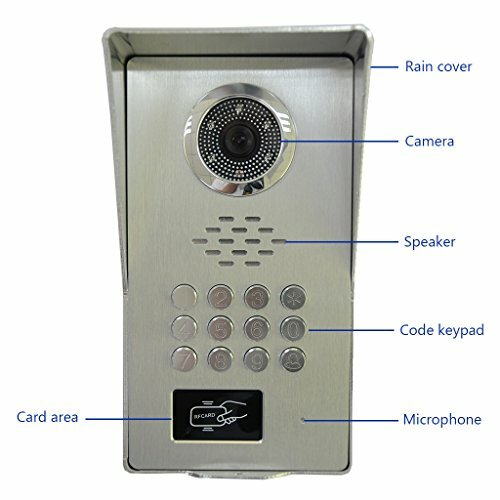 High resolution 700TVL CMOS all aluminum alloy panel camera.3 ways to unlock( Indoor, RFID Keyfob, Password) 92 degree view angle, waterproofing and IR night vision.Wired connect, easy surface mounting. 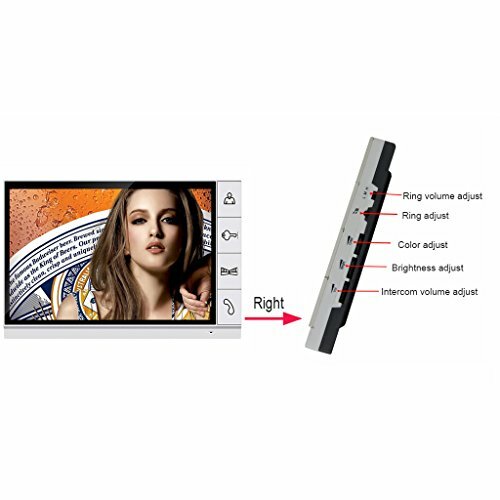 9 inch high resolution color TFT LCD screen. Collocation white press key panel,elegant apperance. 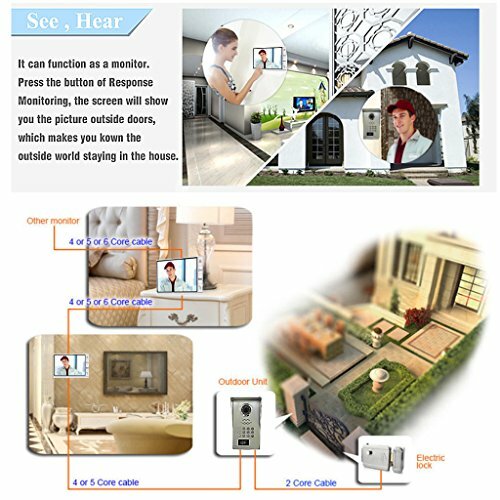 Adjustable color,brightness and volume,Intercom between monitor and camera. 1 x indoor 9-inch color monitor (with a mounting bracket).